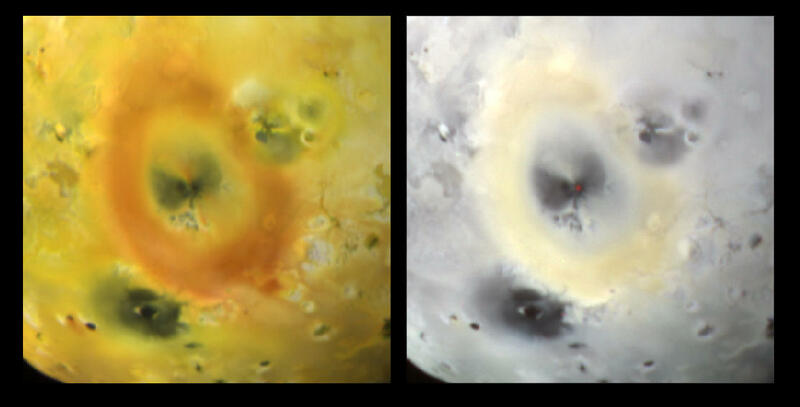 Opis: Glowing hot lava from the heart of Io's volcano Pele is visible in this false-color infrared composite image. It was recorded last month during the Galileo spacecraft's close flyby of the Jovian moon. Pele is near the middle of the large 1,300 kilometer diameter ring of yellowish sulfurous material deposited by its frequent volcanic plumes. 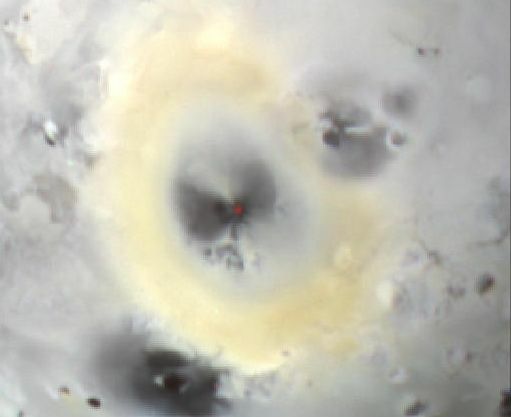 The dull dark red spot on Pele itself corresponds to hot lava in the volcano's eruptive center. Temperatures up to 1,027 degrees Celsius (1,880 degrees Fahrenheit) have been previously measured for the lava. Galileo's close October Io flyby has revealed that the most volcanic body in the solar system is even more active than previously suspected, with more than 100 erupting volcanos. Yesterday, the spacecraft was scheduled to perform an even closer flyby of Io approaching to within 300 kilometers.